Southern Utah is full of beautiful sights, but few rivals the stunning picture of thousands of flowers blooming in a naturally formed rock amphitheater! A visit to the Cedar Breaks Wildflower Festival during the summer is a fantastic way to see one of the most picturesque landscapes in the country adorned with a veil of bright, vibrant colors. You and your kids can also participate in some of the many special activities and tours highlighting the festival! If you want to continue your sightseeing adventure through the region, request access to our free Vacation Guide! 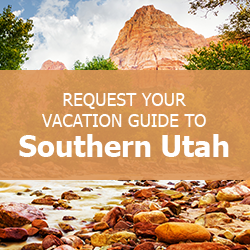 It’s full of the top things to do and places to see in Southern Utah! The National Park Service hosts guided tours through the meadows and forests of Cedar Breaks National Monument during the Cedar Breaks Wildflower Festival. They’ll point out various types of flowers and teach you about the unique flora that calls Southern Utah home every summer season. Be sure to stop by the Visitors Center to get a Wildflower Checklist. As your guide walks you through the area, pointing out which flowers are in bloom, you can keep track of each species you identify. The Cedar Breaks Wildflower Festival also incorporates many activities and events every weekend. The kids will love heading to Cedar Breaks to participate in the many games and crafts featured as a part of the festival as well! For more details on events and happenings during the festival, check out the National Park Service website. Tip: You can also download the Wildflowers of Cedar Breaks App on your smartphone to easily identify over 100 of the most commonly found flowers and plants (available for IOS and most Android devices). You’ll want to bring a camera to capture the sheer beauty of the thousands of blooming flowers around the park. Here are a few photography tips to follow while at the Cedar Breaks Wildflower Festival so you can make the most of your experience! Try to capture flowers that are not in direct sunlight. Sometimes direct sunlight can be harsh and make the photo’s subject appear too bright. Instead, photograph flowers that are in the shade or softly lit by the sun. Get close to the object or scene that you are photographing. To truly capture the beauty and detail of these flowers, get more up-close and personal than you think is necessary to get the best possible picture. Bring along a tripod. This device will help to steady the camera creating an overall better effect. For more wildflower photography tips, take a more in-depth look into the Cedar Break National Monument website! Family Time Vacation Rentals is your Southern Utah home away from home. Whether you’re visiting our gorgeous region of the Beehive State for a quick summer retreat or an extended family vacation, you’ll find the perfect vacation home for you and your family. If you want to stay close to the action of the Cedar Break Wildflower Festival, our Brian Head condos and homes offer an excellent location. We also have rentals in Duck Creek Village, Parowan, and Panguitch Lake. Regardless of which location you choose, you’ll be close to fishing, biking, hiking, ATV riding, and several incredible national parks. Ready to start planning your Southern Utah adventure? Book your rental and get ready to embark on the trip of a lifetime! We look forward to meeting you! Everything You Need to Know About Ramparts Trail in Cedar Breaks — What Will You See on the Alpine Pond Trail in Utah?